Geoff McCausland (B.Mus McGill, ARCT Royal Conservatory of Music) is a musician of diverse experience and training. Growing up in Saint John, New Brunswick he was trained in the Classical tradition, which he continued at McGill University’s Schulich School of Music as well as through intensive training programs including the Domaine Forget Summer Institute, the Orford Arts Centre Summer Academy, and the St. Lawrence String Quartet Chamber Music Seminar at Stanford University. Geoff is a passionate teacher and runs a private teaching studio from his home in Sudbury ON. 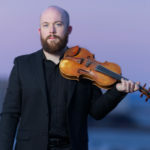 He has lead the violin sections of symphonies across Northern Ontario, and for ten years was a member of the Juno and Felix-nominated Silver Birch String Quartet. With the quartet he recorded two albums, commissioned new works from Canadian composers, and performed alongside such notable artists as Peter Longworth, Simon Fryer, Joel Sachs, Erika Raum, Tanya Tagaq, Serena Ryder, and the Penderecki String Quartet. In 2013 Geoff joined the Sudbury-based band Murder Murder – exploring the art of improvisation, composition and arrangement of Bluegrass and Americana music. They have since released three full-length albums which see regular airplay internationally, performed live on BBC Radio, and toured across thirteen countries. He has also shared the stage/recorded with other artists including Iskwe, Pistol George Warren, Barry Miles, McLean, Jennifer Holub, and Carden Cove.